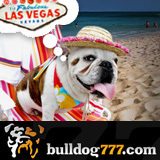 5 February 2013 (London, UK) – Since the winner of its “Master of Bulldog777.com” contest is unable to travel, Bulldog777.com has awarded the Swedish poker player the cash equivalent of the epic Las Vegas vacation prize that he won. Lars Nielsen was automatically entered in the contest when he played poker and casino games and placed a sports bet at Bulldog777.com all in one day. Since Bulldog777.com has an integrated wallet system, players can use the same account to enjoy casino games, play poker, or bet on sports. The casino has dozens of Las Vegas-style games including The Dark Knight online slots game. The sportsbook takes bets on 4000 live in-game betting events every month including NBA basketball, EPL and Russian Premier League matches. The Bulldog777.com poker room hosts a $100,000 free roll poker tournament every Sunday and attracts players of all skill levels. Personalized casino, poker and sports betting assistance is available in English and Russian.